Weekend and one day classes are held regularly throughout the year. See links on sidebar to the right for details of upcoming classes or contact me to go on my mailing list so you will be kept informed. I also hold regular classes every other Thursday at my studio in Iden, near Rye. These are grouped into three session blocks. (Full details here). This year I will also be holding sessions for more advanced students. Again they will be grouped into three week blocks. (Full details here). 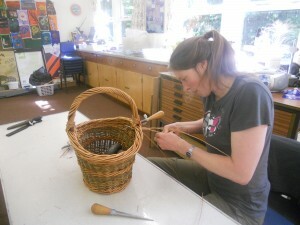 Weekend Classes During a weekend workshop beginners will be able to complete a round basket with a handle that can be used for shopping or storing items at home. You will learn several basketry techniques and be introduced to the preparation and selection of materials. Those with some experience can practice their skills and learn new techniques by making a larger basket or an oval shopping basket Day classes A day class provides an opportunity to complete a small basket if you don't have the time to come on a weekend class. The basket you make will be ideal for bread or fruit. Shorter classes Shorter classes are an opportunity to have a go at weaving with willow without committing to a full basketmaking class. You will be able to make small three of four small willow decorations. Special Arrangements If you are an organisation or a group that would like to organise a class for your clients or members, please contact me. The above are standard classes that I do but if you require something for a specific client group eg children or special needs, we can discuss requirements and organise something suitable.